The cirque is reached after about three-quarters of an hour’s walk west from the bottom of the Far West T-bar on the Whakapapa Skiﬁeld, at around 1900m. Grid ref 293129. Ice forms on shady southwest-facing aspects beneath broad, sunny snowﬁelds. The bluffs can’t be seen from above – approach by sidling from below. The first routes are in a sunnier location on the left of the cirque; for the others continue on into a small lava canyon where a distinctive cave with a high, arching roof is prominent on the left side. It is possible, but by no means necessary, to camp in this cave. On the left side of the cirque, this is not really a technical climb, but a good warm-up. 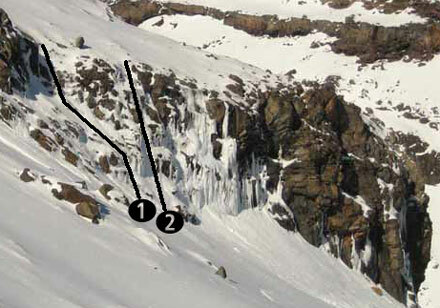 Follow the left slope up to an obvious chute. 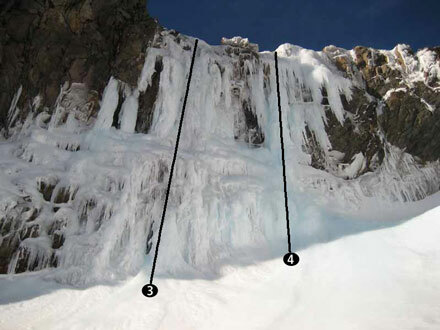 It is possible to finish directly over the top, but the left chute provides a challenge of solid ice, which can be well protected. Climb the obvious central line on the face on the left side of the cirque. The crux is the vertical lower third. The large, steep flow to the right of the cave. Sustained vertical climbing with a short freestanding section at mid-height. Alex Palman took a six-metre fall on the first ascent. This route is on a separate flow further right.